I opened up my two remaining hives for the first time this year and was pleased. Both had capped and uncapped brood. Both had viable queens roaming around laying eggs. Bees in both looked like they were bringing in nectar. In February, they were bringing in pale yellowish-green pollen. Now, it’s bright yellow. My original, remaining hive from 2013, seems to also be my most productive and docile. It’s also the hive that sent a bee, like a guided missile, to sting me in the eyebrow, sending me into anaphylactic shock. That adventure will be the subject of another post. 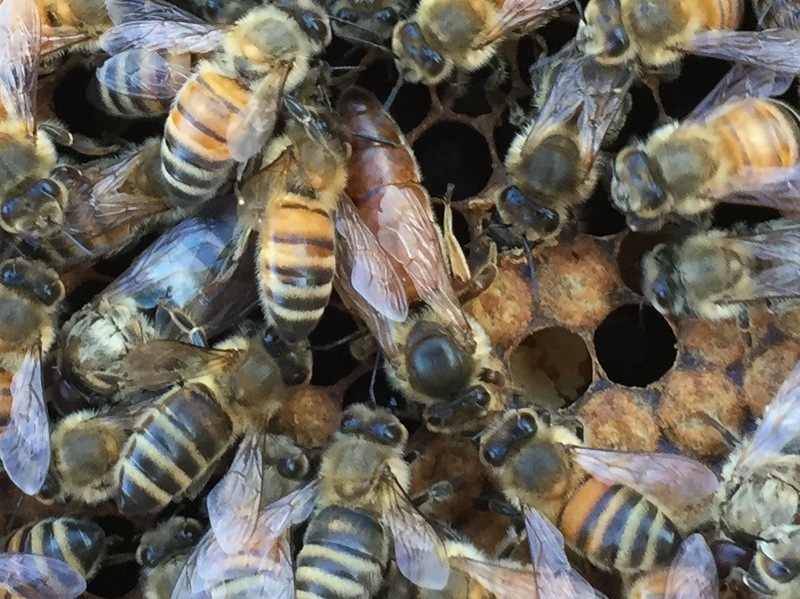 I couldn’t figure out how to combine frames last fall, since frames in all three brood chambers contained brood, honey or pollen. So that hive has three boxes. 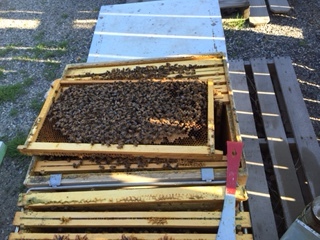 When I looked the other day, the top box was about 30 percent full of honey and had bees that seemed to be drawing out the comb, but no brood. The middle box contained the queen, brood, pollen and honey. The bottom box contained bees drawing out comb, but the comb was empty. My other hive is only two deep with the top box very full of brood, pollen and honey and the bottom box with empty comb being drawn out. Both looked health. My only question is whether or not I need to consolidate the three-box hive into two, or just let nature take its course. Taking Michael Bush’s advice that you’re better off doing nothing than something wrong, I’ll probably do that latter.